Oomph in a bottle. 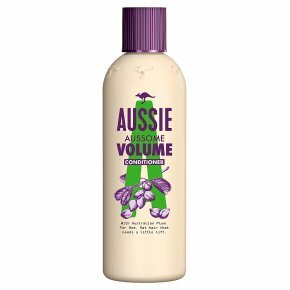 Aussie Conditioner Aussome Volume lightweight formula, with extract of 'Australian Hops', leaves your fine hair with body and fullness from roots to tips while leaving it aussomely conditioned. 'Australian Hops' are a great discovery. It's believed that the proteins they contain coat your hair and help build it up. Leaves your hair and your spirit uplifted from root to tip. Go big or go home. Leaves hair perfectly conditioned and full of body. With Australian Hops extract. For fine, flat hair that needs a little lift.Some say bigger is better. So bring on the big hair with our lightweight conditioner formula, with extract of Australian Hops, to leave hair perfectly conditioned and full of body (I feel a hair flick coming on!). We know it might sound a bit odd to provide your hair with beer ingredients, but trust us, it's believed that the proteins they contain coat hair and help build it up. Will I smell like a brewery you wonder?! Come on - this is Aussie!!! Work conditioner through clean, damp hair. For Aussome results, make sure you washed with Aussome Volume Shampoo. Rinse. Check out your Aussome hair. Oooh yeah.